Beautiful Hand Woven Vintage Anatolian Kilim Cushion covers bright and colourful and eye catching. It is not very expensive yet an easy and unfussy way to decorate any interior, to add style, cordiality, feel and texture so that your house looks beautifully decorated, gorgeous and classy. We can make Kilim cushion covers in any size, Items in stock delivered in 2-3 days. Special orders delivered within 1 to 2 weeks Contact us for more kilim choices. Kilims are flat tapestry woven carpets and rugs that are hand made by the indigenous tribes of the ancient civilizations like Persia, Anatolia, Afghanistan and Turkey. Each piece of kilim is an exemplary specimen of the dexterity of craftsmanship of the indigenous tribes of these respective countries who have been engaged with this art form for centuries. The tradition has been handed over from one generation to the next and yet each kilim is unique in the sense that the patterns woven in these flat rugs are never alike. The colors used in these kilims are from the natural dyes and their hues differ from being soft and subdued to being loud and vibrant. The patterns woven in these carpets are usually of simple geometrical shapes and yet their composition is so intricate that one wonders at wisdom of space alignment of these simple indigenous craftsmen. Curiously enough, this tribal art bears a great similarity with the modern art dictum where shapes and curvatures are reduced to their minimal geometric representation. Kilim cushion covers are made from these authentic kilims that adorn your bed room and drawing room lending it a unique indigenous feel which surprisingly enough goes very well with most of the modern household architecture and furniture assortments. We offer a full and competitive Rugs Cleaning London service on all sizes of rugs and kilims. We have undertaken specialist restoration work including cleaning and repairs, insurance salvage work following floods, fire and accidental damage and are now recommended by many local and national insurers. Turkey, because of its unique geographical position has imbibed the cultural heritage of both the eastern and western hemisphere. The land which was the seat of many ancient civilizations had been a home and an abode for assimilation of diverse indigenous trends of art and craftsmanship and this gets reflected in the tribal art specimens that are produced today. 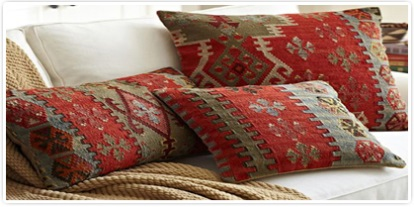 Kilim cushion covers made from authentic Turkish kilim have great demand in the art conscious populace of the west. Unlike the machine made products that produce patterns of endless repetitions, these kilim Pillow Cover are unique in the sense that the pattern woven over one kilim is never identical with another one so that you can rest assured that the Turkish kilim you buy would not have an identical copy anywhere in the world. Persia has been a seat of great ancient civilizations and its indigenous tribes have been producing art work for centuries. These art works have a simplicity and subtlety of the ancient wisdom that has impressed the connoisseurs of modern art. 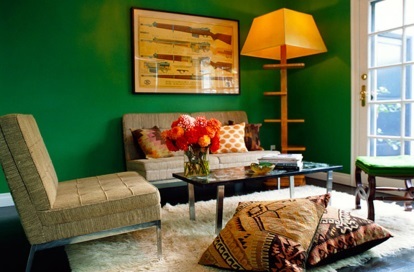 The cushion covers are made from authentic Persian kilims that have a unique identity of their own found in the intricacies of their designs and a special application of colors. These cushion covers are well worth the money as they lend a unique character to your home décor that when aligned with the right choice of furniture and lighting would surely impress one and all. Kilim cushion covers made from the kilim of any of the above mentioned ancient cultures are a thing of pride for the owner. Each piece of kilim is like a piece of art carefully woven and preserved for the posterity, so that your choice of these art works would be appreciated by the generations to come. Your drawing room would become a perfect harmony of the old and the new as indigenous cultures lend inspiration to modern art. Beautiful Kilim Rugs View one of the most comprehensive collections of flat-woven Kilim Rugs. Kilim rug the warm colours and rich pattern of a flat-weave kilim rug help a leather piece settle into the room.